Be sure to leave some nice parting comments on her profile. Please take 5 minutes of your time to fill out this new survey so we can plan the next set of upgrades for the site! New Acy's and Ace's Pick selected! And going to some early MMO! We are still scouting for a Leafa, Lizbeth and Sinon to guard the high level Sword Art Online guests at Sakuracon! Time is ticking on your ability to enter our major Sailor Moon events for this summer! And we have special Valentines flavor Picks of the Month from Yona! Tons of casting calls are now online for upcoming conventions! New Acy's and Ace's Pick selected! Be sure to follow our events on Facebook! New Acy's and Ace's Pick selected! With our special haunting theme for Halloween! New Acy's and Ace's Pick selected! Is it fate? We're not ignoring our cosplayers either - we also have some big changes in store for ACP/ACE, but aren't quite ready to talk about those yet. We've uninstalled LLSIF from Genri's phone though, so these changes should come sooner rather than later. In the meantime, enjoy ACS, and if you're going to Sakuracon or Anime Boston, be sure to say hi to our cosplayers! Hopefully some of you still like idols. We have casting calls for Sakuracon and Anime Boston! February means Valentine's Day and Katsucon on the convention circuit! New Acy's and Ace's Pick selected! You're feeling the OTP right? ACPARADISE cosplayers: when you upload photos to your own cosplay page, do you want to be able to tag friends that may be present in the photos? New Acy's and Ace's Pick selected! Do you believe in HEROES? And we have three for Sakuracon 2015 already! New Acy's and Ace's Pick selected! Are you dead or alive? Better start gearing up for the holidays! What better gift for your friend than to upgrade their ACP account? Or put it on your wish list for others! Remember the @combatradio Breakfast with Santa charity is this weekend! Hope you got all your good will ready! New Acy's and Ace's Pick selected! Gotta catch them all! For some exciting news regarding the Library of Congress! There's plenty of things to do at Otakon from Aniplex USA, be sure to try to hit them all! Friday, July 4th at 1:45PM at Video 3! Saturday, July 5 at 12:30 PM at the Aniplex USA Booth #901! -Only official merchandise will be signed (no fanart, sorry). Autograph boards and program guides are fine though. -One item per badged attendee per autograph session. The Sailor Moon OFFICIAL Panel happens on in Room LP1 (Petree Hall)! The Premiere of Sailor Moon Crystal! ONE DAY VOTING for our Kill la Kill Cosplay﻿ Contest! Voting will end on 6-30-2014 11:59 PM EST (8:59 PM PST) for our Kill la Kill Cosplay﻿ Contest! 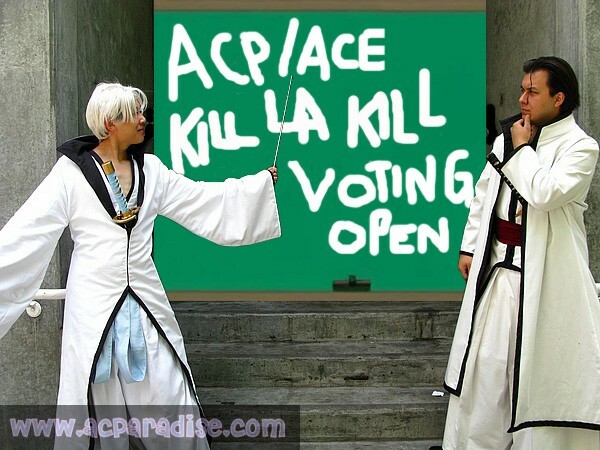 Each ACP Member gets TEN votes, be sure to look through all the entrants carefully and make your choices! The Kill la Kill contest is sponsored by Aniplex. Thank to all our wonderful entrants! Be sure to tell all your friends to look at all the entries, and vote too! New Acy's and Ace's Pick selected! And we're going a bit of a different direction with some HORROR. Since it's June that means summer conventions are rapidly approaching, namely Anime Expo. And if you've been locked up in a cave recently, then make sure to browse our list of cosplay events for AX and Otakon! Entry Deadline: 06-24-2014 11:59 PM EST <- NOT PACIFIC YO! Anime Expo 2014 is going to be PACKED with Kill la Kill craziness, and to help that we're helping Aniplex host a cosplay contest for Kill la Kill cosplayers attending AX! 10 Finalists will be picked in the online portion of this contest, plus one "Wildcard". The wildcard slot will be picked at-con, right before the contest starts. These 11 people will be showcased on stage, and from there, 2 winners will be chosen and given special prizes, including special seats to the Kill la Kill Stage Event and/or autographs/photos from the staff. So tell your friends and enter today! Sign up for the largest Sailor Moon Cosplay Gathering at Anime Expo 2014! How would you like it if YOUR Sailor Moon cosplay could be seen on the upcoming Sailor Moon DVD/BD release? VizMedia will be recording the gathering and lucky cosplayers who've signed up on our page will be filmed for interviews. The interviews will be sent to Japan (and Naoko Takeuchi!) to show them how much America loves Sailor Moon. Also, these interviews may end up on the English DVD/BD release. True Sailor Moon fans won't want to miss out on this gathering (to set a new world record) and a chance to be immortalized on the DVD/BD release so we encourage you to sign up for the gathering! You can tell us why you should be interviewed when you sign up on the page (in the comments section), and make sure to upload the cosplay you plan to wear to the gathering to ACParadise.com! We'll be posting the date and time when it becomes available! Make sure to share share share with fans of Sailor Moon so they can get in on this historical event! Not many details besides that available right now, so if you're interested at all in helping out and have a costume from any of the Monogatari series, please volunteer to this NEW event! Limited to ACParadise cosplayers only with uploaded photos of their costumes on acparadise.com. If you're not on ACP yet, no worries, sign up for an acparadise account today, it's easy! We'll have more information as time passes. Casting call for One Piece Cosplayers at Anime Expo! Not many details besides that available right now, so if you're interested at all in helping out and have a costume from One Piece, please volunteer to this NEW event! Cosplayer Casting Call for Official Sailor Moon cosplayers at Anime Expo 2014! Want to be one of the official Sailor Moon Cosplayers, approved by creator Naoko Takeuchi herself? Now's your chance! Limited to ACParadise cosplayers only with uploaded photos of their costumes on acparadise.com. Casting Call for Tales Of Xillia 2 (& Other Tales Series) Event at Anime Expo®! Not many details besides that available right now, so if you're interested at all in helping out and have a costume from any of the Tales series (Preference to Xillia 2) please sign up! Share this with your friends. On all your media outlets. Cosplayer Casting Call for Kill la Kill Cosplayers at Otakon! Not many details besides that available right now, so if you're interested at all in helping out and have a costume from Kill La Kill please sign up! Share this with your friends. On all your media outlets. Cosplayer casting call for Nisekoi Cosplayer Event at Otakon! Not many details besides that available right now, so if you're interested at all in helping out and have a costume from Nisekoi please sign up! Share this with your friends. On all your media outlets. Jojo’s Bizarre Adventure Cosplayer event at Anime Expo®! Not many details besides that available right now, so if you're interested at all in helping out and have a costume from JoJo's Bizarre Adventure (All Star Battle variants preferred) please sign up! Share this with your friends. On all your media outlets. Not many details besides that available right now, so if you’re interested at all in coming out, sign up so we can get an accurate headcount. It’s official! We will be holding a Cardcaptor Sakura CLAMP Cosplayer gathering at Anime Expo® at the NIS America, Inc. booth to celebrate the upcoming release of the CCS Premium and Standard Editions! We’re organizing a gathering just for you! http://www.acparadise.com/ace/events.php?eid=235 Please spread the word and get your friends to join up! Cosplayer casting call for Love Live - School Idol Project Cosplayers at Anime Expo® 2014! Cosplayer casting call for Magi Cosplayers at Anime Expo® 2014! Cosplayer casting call for Dangan Ronpa Cosplay at Anime Expo® 2014! Cosplayer casting call for Kill la Kill Cosplayers at Anime Expo® 2014! Cosplayers will be involved in the Special Kill la Kill event at Anime Expo, featuring KILL LA KILL guests coming to Anime Expo including the Producer, Scriptwriter, Character Designer, Singer Eir Aoi and the voice actresses for Ryuko and Satsuki! Cosplayer casting call for Sword Art Online Cosplayers at Anime Expo® 2014! Cosplayers will be on hand for the premiere of SAO II and accompany the special SAO Guests, Reki Kawahara and abec, the author and illustrator of Sword Art Online. Make sure you have your conventions status up to date so you will get notifiers of new events as they are added! We have a bunch of official ACP events planned for summer cons so check it out! The Official @MagiUSA Panel at Sakuracon will take place on Saturday 10:00AM - 11:00AM PANELS 2 (4C-2) hosted by Aniplex USA. Make sure to line up early to get the best seats! Come to the official magi cosplayer gathering at the aniplexamerica booth at sakuracon, Saturday 1:00PM - 2:00PM! The Aniplex booth is located in the Exhibition Hall #335, 234, 333, 232. Bring your cosplay and your camera and be sure to participate in the fun events we will have there! The Masunari and Akai Autograph session will be taking place in AUTOGRAPHS 4B on Saturday 11:30AM - 12:30PM. Make sure to line up early! The Character Designers of Sword Art Online and Magi, Shingo Adachi and Toshifumi Akai, will be Drawing Live at sakuracon in Seattle, WA on Saturday April 19th at 4:00PM - 5:30PM in PANELS 1 (6C). Those who attend the Live Drawing Panel has a chance to win those drawings. Line up early to ensure you get a raffle ticket! Don't Miss it! Don’t get left behind! Make sure you come to the Official Sword Art Online cosplay gathering gathering at the aniplexamerica booth at sakuracon, Saturday 10:15AM - 11:00AM! The Aniplex booth is located in the Exhibition Hall #335, 234, 333, 232. Bring your cosplay and your camera and be sure to participate in the fun events we will have there! The Official Sword Art Online Panel at Sakuracon will take place on Saturday 11:30AM - 12:30PM at PANELS 2 (4C-2) hosted by Aniplex USA. Make sure to line up early to get the best seats! Make sure to line up early! We hope you enjoyed our annual April Fools, American Cosplay Backer. Including tomorrows Fandom Society Cosplay Ball! Hope you got your "acparadise" discount when you bought your tickets! New site available for beta testing, American Cosplay Backer! Come help us test out our new sub-site, American Cosplay Backer! American Cosplay Backer - Because why pay for your hobby when you can get your fans to do it for you? We here at American Cosplay Backer are here to help - by connecting fantastic cosplayers with the fans that would make their dreams come true. Cosplayers, ever wanted to make your dream costume, the one that would require authentic materials costing thousands of dollars? Photographers, have the PERFECT photoshoot in mind that happens to involve travelling halfway around the world? Through our site, find people that share in your dream, and with their combined efforts, make it happen! Winners for Dangan Ronpa Cosplay Contest Announced! The Dangan Ronpa cosplay contest is sponsored by NIS America. Thank to all our wonderful entrants! Please extend your congratulations to them! New Acy's and Ace's Pick selected! Are you ready to D-D-D-DUEL? Voting ends soon for the Dangan Ronpa Cosplay Contest! 4 Votes Each! Be sure to tell all your friends! Voting will end on 3-1-2014 11:59 PM EST (8:59 PM PST) for our Danganronpa Cosplay Contest! Each ACP Member gets FOUR votes, be sure to look through all the entrants carefully and make your choices! The Danganronpa contest is sponsored by NIS America. Thank to all our wonderful entrants! Danganronpa Cosplay Contest Submissions end 2/23/14! It's February at ACParadise! Happy Lunar New Year! New Acy's and Ace's Pick selected! They're both MARVELous.